"An Examination of the State of Cinema at The 59th San Francisco International Film Festival"
What does it mean to be black in America? What kind of black person are you? What role are you playing either consciously or otherwise, for or against the collective struggle of black people? If, as a black person, you have a platform of some kind, should you allow anyone black or white, to dictate how you use it? There is a point in fact to these questions. These are some of the very ideas that the discussion, led by the award-winning New York Times critic, Wesley Morris, asks the audience to consider on a sunny, and very warm Saturday afternoon during the second weekend of the 59th annual San Francisco International Film Festival. Morris' talk focused on the radicalization of the screen legend Sidney Poitier and how that is reflected in today's conversation about race in cinema. He dug deep into the role he saw Poitier playing both in film and outside of it. "White liberals wanted him to make them look good, black America wanted him to win, which during the Civil Rights movement, meant being racist," Morris stated. During the height of the Civil Rights movement, Sidney Poitier reached the pinnacle of his stardom, and he was in fact a star. The first black mainstream movie star, according to Morris. Now, upon hearing that, you might ask about such figures as the great Harry Belafonte, who was friends with Poitier, or what about the legendary baritone-voiced Paul Robeson? One could make a pretty strong case for Robeson being the predecessor to Poitier as a movie star, no? Perhaps when you think about how we perceive film stars today, maybe not? 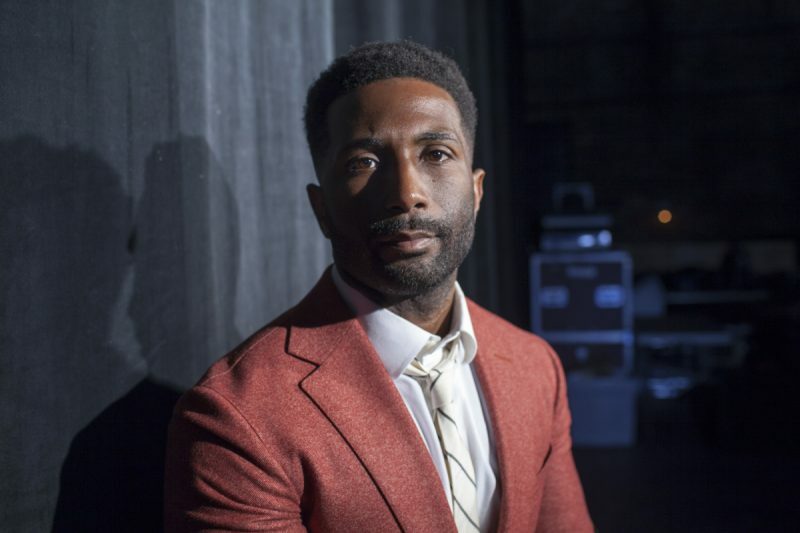 [caption id="attachment_83051" align="aligncenter" width="600"] Journalist and New York Times Critic at Large Wesley Morris before delivering the 59th San Francisco International Film Festival State of Cinema address, April 30, 2016. © Pamela Gentile[/caption] What is the criteria for a film star anyway? Some professors of film studies will tell you that they have to get bodies in the theaters at the end of the day. They will tell you that they must have mass market appeal, that they have to be likable off-screen and appeal to both males and females as well as cross cultures. One such professor of mine said of Tom Cruise once that "he knows how to open a picture." Regardless of how you feel about him, folks are going to pay to see his movies because there is a consistency with how the box-office does with regard to a movie he headlines. For a brief period in the mid to late 1960s, Poitier seemed to fit that bill. According to Morris, Poitier's electric stardom peaked with 1967's In the Heat of the Night, a film for which Poitier was not nominated for at the Academy Awards, despite turning in one of his strongest ever performances. Yet, it was his white co-star Rod Steiger who won the award for Best Actor. That snub is not surprising. Nor is it the point of what Morris was getting at. So, Poitier did not get the Oscar nomination. He did however, manage to do something that perhaps had an effect that reached far beyond the moment in time during which it took place. He struck a cultural nerve so deeply at a time of heightened tensions in America with respect to race. What did he do, you ask? Well, Poitier slapped someone. [caption id="attachment_83052" align="aligncenter" width="620"] Sidney Poitier as detective Virgil Tibbs "In the Heat of the Night." 1967; United Artists. [/caption] The centerpiece of Morris' talk was something he dubbed "The Slap", which takes place at a crucial point in In the Heat if the Night, where Poitier's character Detective Virgil Tibbs, and Rod Steiger's Police Chief Gillespie visit the home of a suspect in a murder investigation. What begins as a more or less civil meeting, ends in one potent moment when the suspect, who is white, approaches Detective Tibbs and slaps him... and Tibbs slaps him back! This kind of thing was unheard of in any film up to that point. A black character retaliating in such a fashion against a white character in film just did not happen. Even more remarkable is the fact that "The Slap" does not appear in the novel on which the film was based, nor was it in the original screenplay. Poitier would not agree to take on the role unless it was written into the script. Though the Civil Rights Act of 1964 was passed, this did little to quell unease between black and white America during that time. Now here you have a white person slapping a black person of authority and the black person returns the favor. Morris explains that Poitier's action had a resounding effect on generations since. Hence, the radicalization of Sidney Poitier. It was a mighty strike in favor of black America for certain. This speaks to the deeper power that film possesses in that, certain aspects and people can become larger than life and transcend the screen. Audiences rally behind an ideal and this too can get people to come a movie or follow that ideal in a protest. Sidney Poitier was such an ideal whose very presence continues to be just as important now as it was then. But what does all this mean to us now? It means that the state of cinema today has in many ways changed since the late 1960s. It means that good or bad, the radicalization of Sidney Poitier was necessary in order for such change to be facilitated. Race is less shied away from in film nowadays than it was previously. It is continuously being examined and scrutinized to the point where it could be considered annoying to some. Wesley Morris' discussion was all about that in the ways that you might come across in an academic setting. He approached the topic with the chops and enthusiasm of an instructor coupled with the curiosity of a student and the experience was that much better for it. Wesley Morris is a Pulitzer Prize winning critic for the New York Times. The San Francisco International Film Festival ran from April 21 - May 5, 2016.